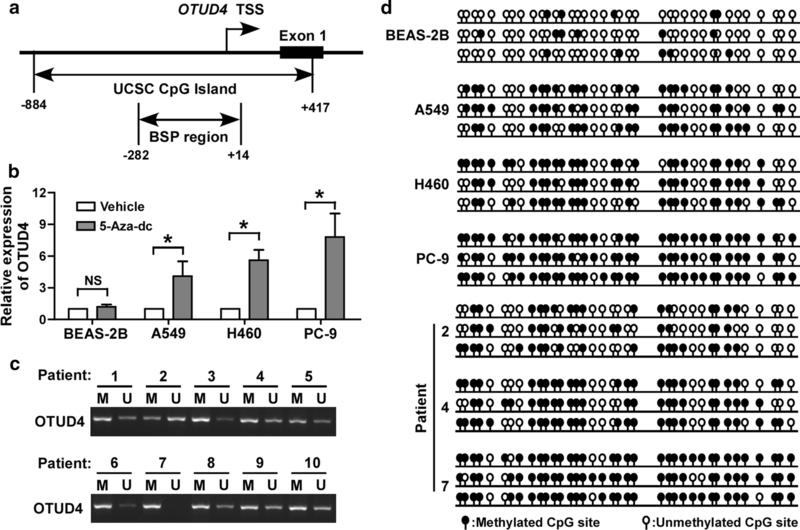 OTUD4 has been reported to play multiple roles in DNA damage repair. Abigail Lubin and colleagues identified OTUD4 as a binding partner of XPC and modulating the ubiquitination of XPC . XPC is an important positive regulator of NER [23, 24], thus they proposed that OTUD4 involved in NER. However, because ubiquitination of XPC had been proved both positively and negatively regulating NER [25–27], which might result from different type chain linkages of ubiquitination at different lysine residues, the exact role of OTUD4 in NER is not clear. By systematically analyzing, Yu Zhao et al. demonstrated that the OTUD4 could complex with USP7-USP9X. They proved that the OTUD4-USP7-USP9X complex was required for alkylation damage resistance and repair via promoting stability of ALKBH3, a demethylases for alkylation damage repair . In our study, we find that OTUD4 could radiosensitize NSCLC cells by inhibiting the HR DNA repair signaling (Figs. 3 and 5), which broadened the role of OTUD4 in DNA damage repair. OTUD4 was originally identified as a K48-specific deubiquitinase . Very recently, Nima Mosammaparast et al. proved that OTUD4 could switch to a K63-specific deubiquitinase upon phosphorylated near its catalytic domain. Numerous evidence have proved that ubiquitinase and deubiquitinase play important roles in DNA damage repair signaling transduction [30, 31]. According to a previous report, knockdown of OTUD4 increased the ubiquitination of XPC, which suggests the deubiquitinase activity of OTUD4 might be essential for NER . Here, we show that OTUD4 inhibits HR repair (Fig. 5d, e). Yet, whether the deubiquitinase activity of OTUD4 involves in HR repair and what the exact mechanism is unexplored. Because K63 polyubiquitination plays pivotal roles in HR repair , we propose a hypothesis that OTUD4 might be phosphorylated by ATM and thus function as a K63-specific deubiquitinase to inhibit DSBs HR repair. Indeed, a SQ-rich region (aa334-aa458), which is characterized as the motif phosphorylated by ATM [33–35], is present in OTUD4 (data not shown). Nevertheless, Nima Mosammaparast et al. demonstrated that OTUD4 promotes alkylation damage repair by promoting stability of ALKBH3, which is independent on the deubiquitinase activity of OTUD4, but instead depends on the deubiquitinase activity of its interactors, USP7 and USP9X. Thus, OTUD4 might also function as an adapter and modulates HR repair signaling via other interactors. However, more investigations are needed to validate and uncover the underlying mechanisms. 12935_2019_816_MOESM1_ESM.tif Additional file 1: Fig. S1. 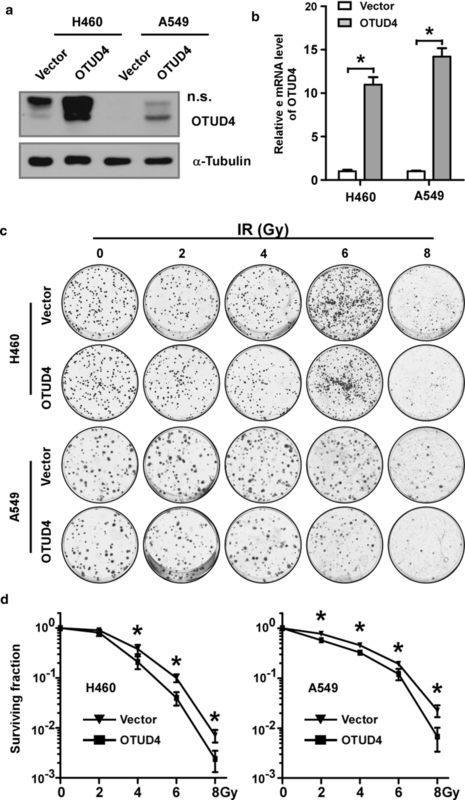 Overexpression of OTUD4 increases radiosensitivity of PC-9 cells. (A) Western blotting and real-time PCR validating overexpression of OTUD4 in PC-9. (B) Representative images of cell clonogenic formation. (C) Statistical quantification of cell clonogenic formation efficiency. α-Tubulin served as loading control. Error bars represent SD from 3 independent experiments. *, p<0.05. 12935_2019_816_MOESM2_ESM.tif Additional file 2: Fig. S2. 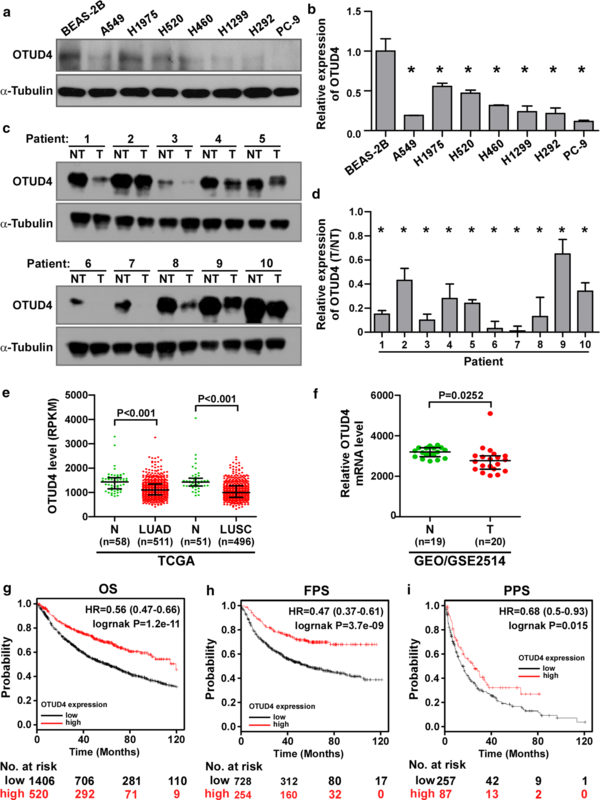 Effects of OTUD4 on cell cycle and apoptosis in NSCLC cells. (A) Representative pictures of cell cycle distribution of indicated cells without IR. (B and C) Representative images (B) and statistical quantification (C) of NSCLC cells without IR. Error bars represent SD from 3 independent experiments. NS, not significant. 12935_2019_816_MOESM3_ESM.tif Additional file 3: Fig. S3. OTUD4 inhibits DNA damage repair. (A and B) Representative pictures (A) and quantification (B) of γ-H2AX foci in vector and OTUD4 overexpressed cells treated with IR (6Gy) and allowed recovering for indicated time. (C and D) Diagram (C) and homology repair efficiency (D) determined by FACS of EJ5-U2OS cells transfected with indicated plasmid. (E and F) Western blotting analysis of the expression of OTUD4 and HA-I-SceI in DR-GFP-U2OS (E) and EJ5-U2OS (F) Cells. Error bars represent SD from 3 independent experiments. *, p<0.05.